With the encouragement from a friend, and the fact that I realized I don’t WANT to work on my drawing and sketching skills as much as I thought i did AND realizing I LOVE the creative challenge, I have decided to leave the Greek Mythology behind. The new Mythos I will be creating from is…. We will be exploring the new Gods of the earth today. Traditionally, gods were created in mythology to explain naturally occurring events, explain things that have occurred in the past, or give personalities to phenomena. Dedicated to my friend Jeannie…the inspiration for my new creative path on this 365 day challenge. Chad was conceived after his mother, Selma Lou, and father, Chuck Jr., were enchanted by the magical powers of the wizardly potions of Captain Morgan, a ruthless pirate, and shooters of Cuervo. His birth was somewhat of a surprise and he was raised on the brown nectar of cocoa-coala which gave him the powers of speed and agility. When he reached a certain age, the cocoa-coala no longer helped him. He quested and went to many lands to finally defeat the Star crowned mermaid named “Buck” who granted him a grand goblet of ever flowing mocha. That’s funny! 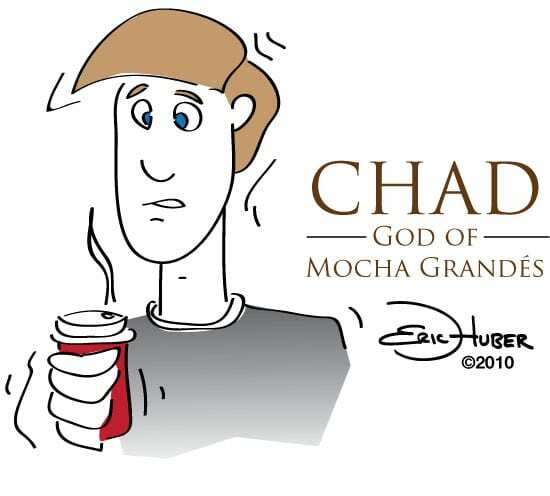 I like the story of Chad.